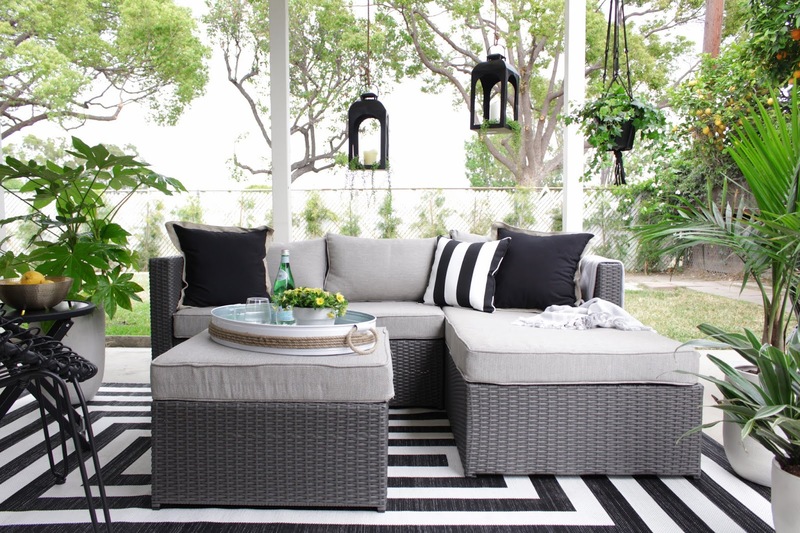 Oscar Bravo Home: An Outdoor Makeover with THE MOST Versatile Patio Furniture EVER! 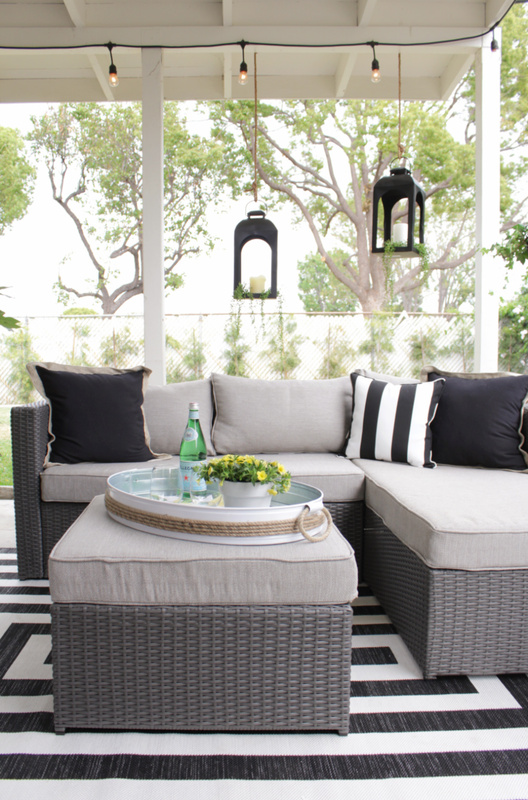 An Outdoor Makeover with THE MOST Versatile Patio Furniture EVER! *I want to thank Ashley Furniture HomeStore and BigGreenEgg for sponsoring this post with some awesome merchandise for me to review with my readers. Like always, my opinions are my very own. 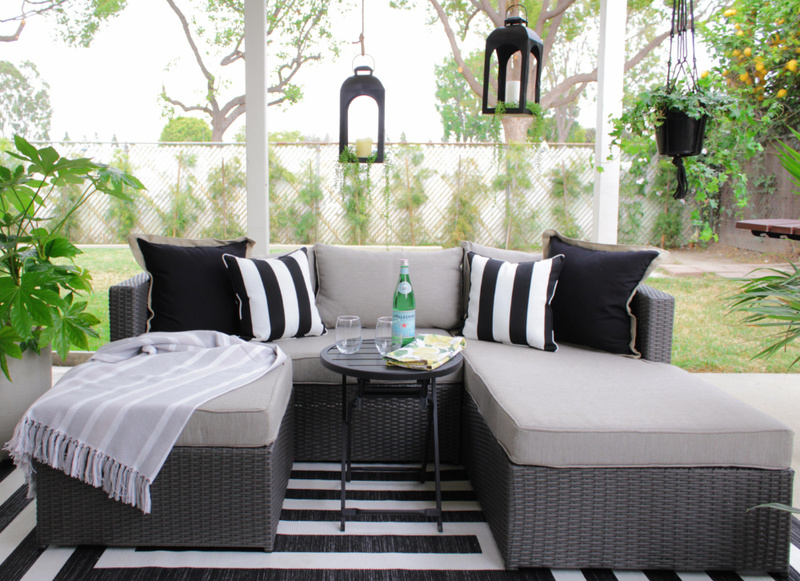 You guys, its time to get your backyard ready for SUMMER! T'is the season for outdoor gatherings with friends and family, sipping margaritas, grillin' some ribs, chowin' down on that potato salad your aunt always brings... you know what I'm talking about! Aside from all that yummy food, we gotta have a nice place to entertain, am I right? That's what these new homeowners were craving in their backyard. Meet Samantha and Ernesto. 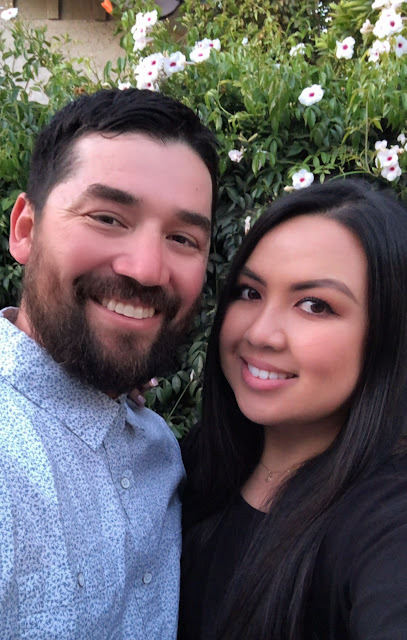 This dynamic duo recently purchased their beautiful home in Lakewood, CA and have made some awesome changes inside but their backyard was getting a bit neglected. Ernesto happens to be my brother-in-law so when the topic of redoing their patio came up, he mentioned having me help them and I was like DUH! OF COURSE!! 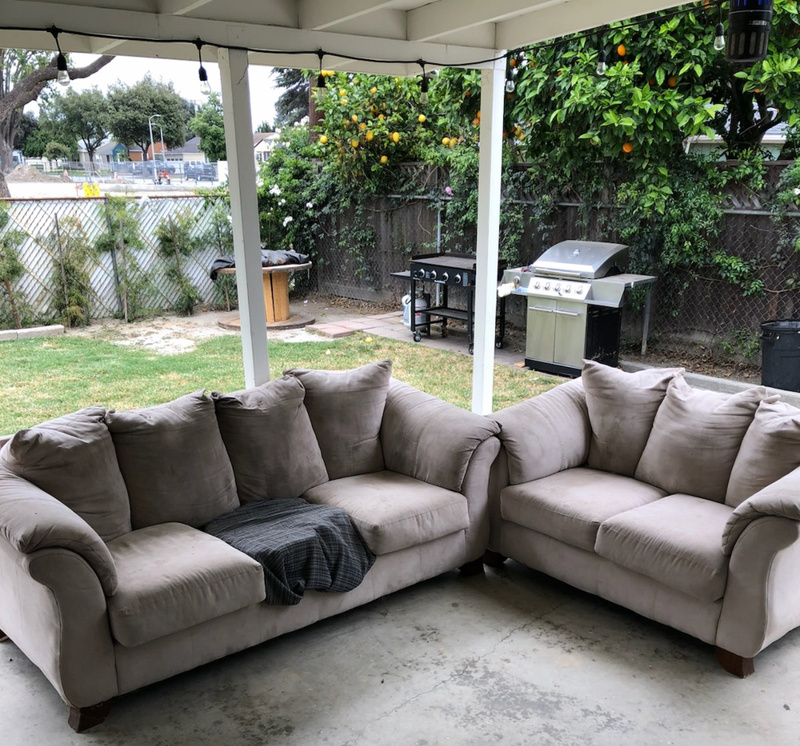 Their patio furniture consisted of two hand-me-down sofas that have DEFINITELY seen better days and no member of my family was going to live their lives with ugly patio furniture! Not happening! I mean, they can throw an amazing get-together with enough food to feed the entire neighborhood, but I wanted them to be house proud! They deserved a cool, stylish space for not only their guests to lounge in, but also for them to chill out and relax in after a long day's work. 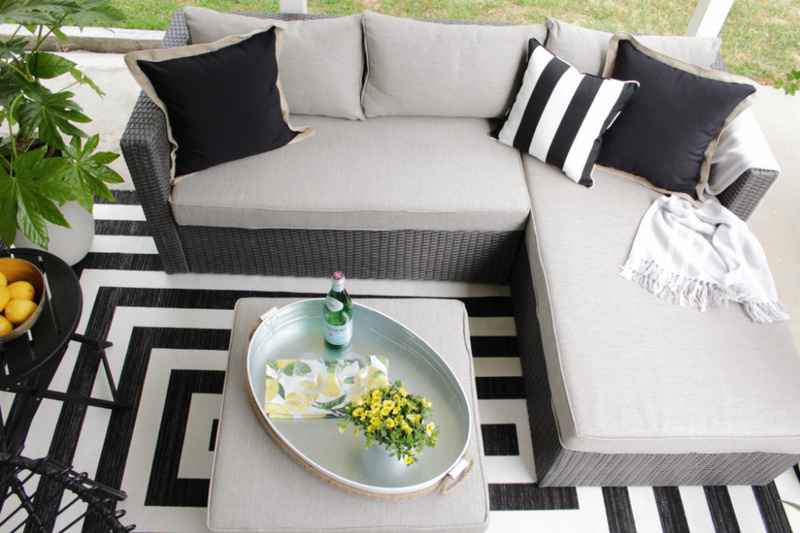 I wanted to give them an outdoor space that is stylish, functional and versatile. The "Pheasant Trail 3 Piece Sofa Set" from Ashley HomeStore definitely reflected that with its clean lines and neutral color scheme. I loved it! 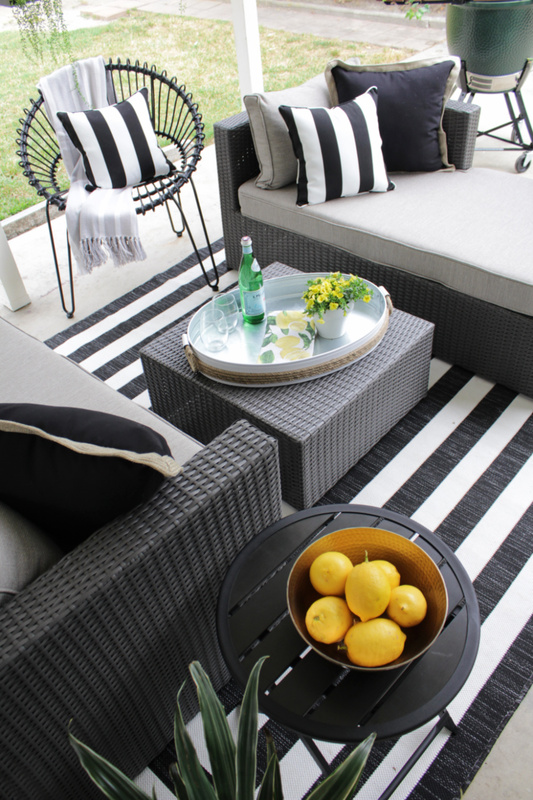 See how we transformed this patio using a simple color scheme of black and white and this awesome piece of furniture. AND, we are not only giving you ONE look, we are giving you FOUR different looks because you know I'm extra like that! We were able to move the furniture around to make different seating arrangements and it was so fun! Here is the first look which is how the "Pheasant Trail Sofa Set" is shown on the website. The loveseat on the left, the chaise on the right and the ottoman in the middle which you could use to put your feet up or throw a tray on it and use it as a table. Another option we tried was to push the ottoman against the sofa to make a U-shape. Now we have two chaises! All we did was add a small table in the middle for drinks. Perfect for watching a movie outdoors! Next, we separated the sofa and chaise to create a conversation area. We got rid of the cushion on the ottoman and used it as a coffee table! Genius, right? Our last look was combining the seats to make one long seating area, kind of like a long settee. We had so much fun creating all these looks with the "Pheasant Trail Sofa Set". I felt like I was like playing with giant building blocks 😁 It was such an easy project (thanks Ernesto and Samantha for trusting me). 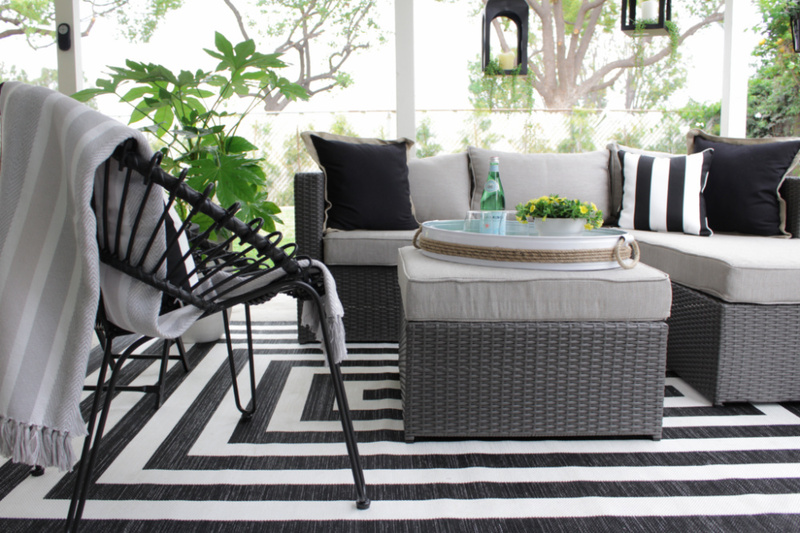 All it took to complete the project was a rug, a few pillows, a tray, some cool black lamps and some potted plants. We were literally done with the space in one day! We also received an interesting-looking ceramic charcoal grill from Big Green Egg! We've used it already and oh-em-gee... this thing is amazing. The big green egg is as versatile as the furniture! It grills, it smokes your meat and is even an oven so you can cook pizza and veggies in there! I have awesome news for all my readers!!! 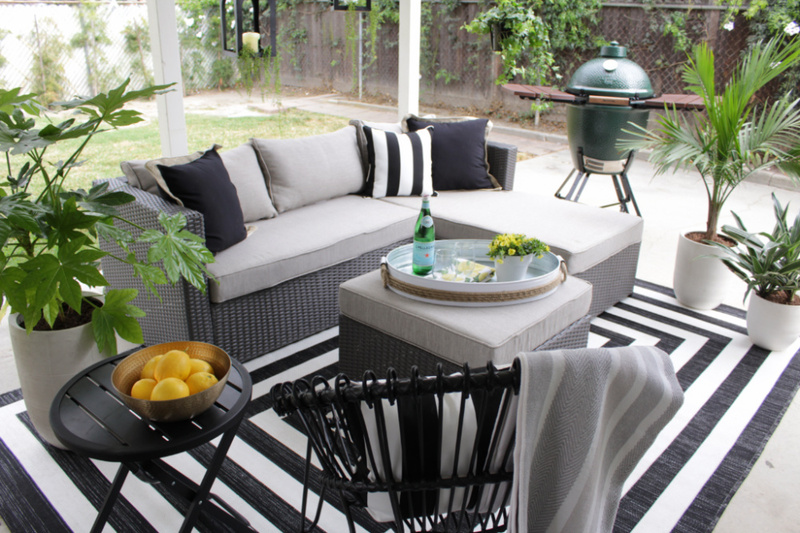 The people from Ashley HomeStore and Big Green Egg are giving away an OUTDOOR MAKEOVER plus A BIG GREEN EGG PACKAGE to ONE LUCKY WINNER!! This package is valued at $8,500! Crazy, right?! It would be so cool if one of my readers won this package!! 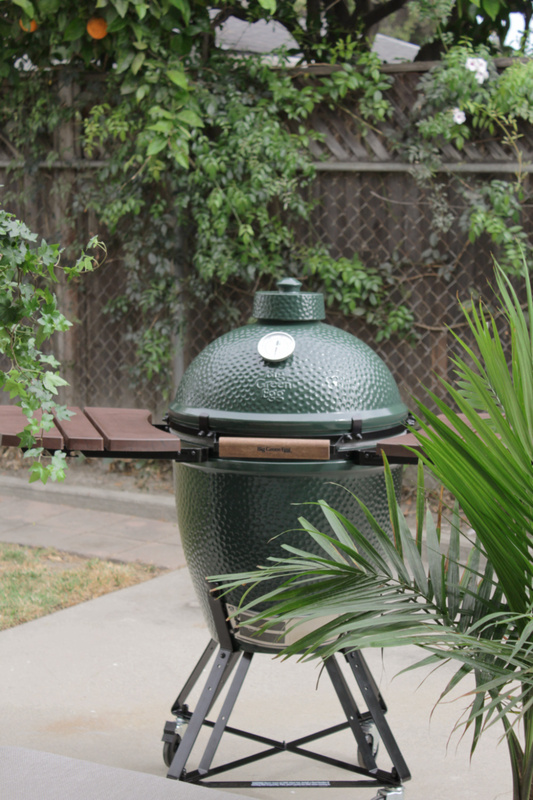 And aside from the main prize, there will be 10 runner-ups who will receive a Big Green Egg package! I'm sharing the link with you and wishing you the BEST OF LUCK! I am seriously super HAPPY with how Ernie and Sam's patio came out! 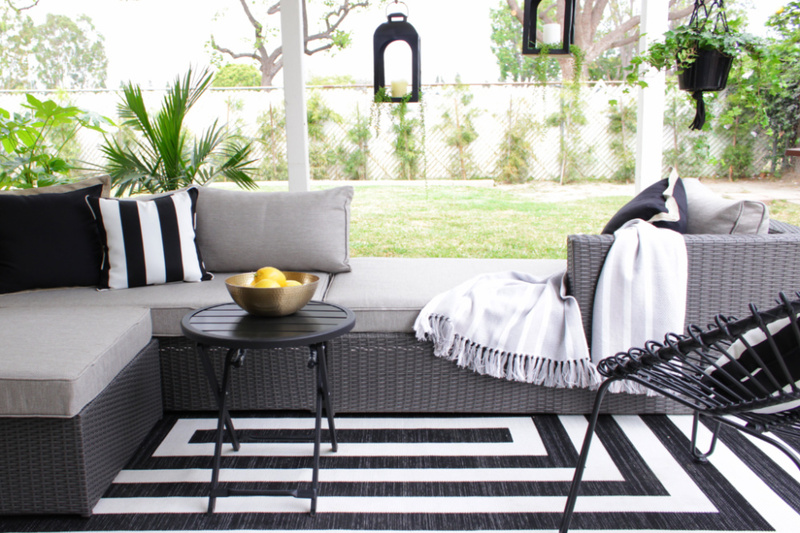 The color scheme feels young and modern and the size of the furniture is perfect scale for their patio or really any smaller sized patio space. 'Till next time! Don't forget to enter the sweepstakes! Amazing as always!!! I wish it was in my patio :( LOL! What an amazing transformation, great job Oscar! Hey! Nice to "see" you here! :) Thanks so much! You get this in sports stores, car showrooms and other retail outlets where products are subject to progressive updating and the previous models have to be sold off to make way for the next generation. Love your photos of the patio in progress. The end product looks amazing. Wish I was that patient and talented to put something like this together. Thank you for sharing your awesome patio with everyone.